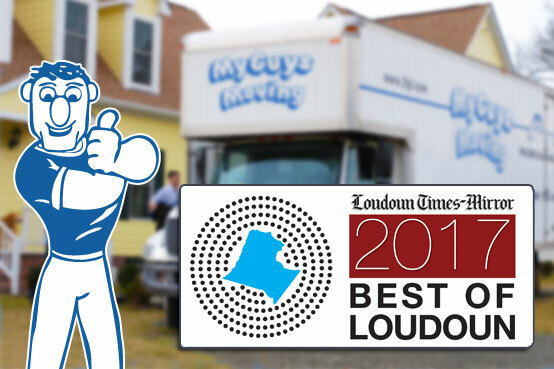 My Guys Moving & Storage was voted one of the Best Moving Companies in Loudoun County for the fourth year in a row. The Best of Loudoun 2017 poll, conducted by the Loudoun Times-Mirror, received 302,140 total votes cast by 27,582 registered users. To see all the winners, check out the publication’s special section, and look for My Guys on page 34. There were some new categories, such as Best Makeup Artist, and there were some upsets in this year’s contest, perhaps most unexpectedly in the residential realtor category where last year’s winner and runner up both dethroned. The most votes were cast in the following categories, with the winner getting over 1000 votes each: Groceries, Hospital, Carwash, Hamburger/Cheeseburger, Bakery/Pastries, Pizza, Most Colorful Character, Distillery, Agritourism Attraction / Event, and Movie Theater. There were over 200 categories, and My Guys Moving was thrilled to be voted as one of the top rated moving companies in Loudoun County in the category of Moving Service. Thank you, Loudoun, we love you!